John Legend partners with Samsung for a $1 million education competition based on a community-driven curriculum. Corporate social responsibility projects with plastic celebrity photo ops are a dime a dozen. 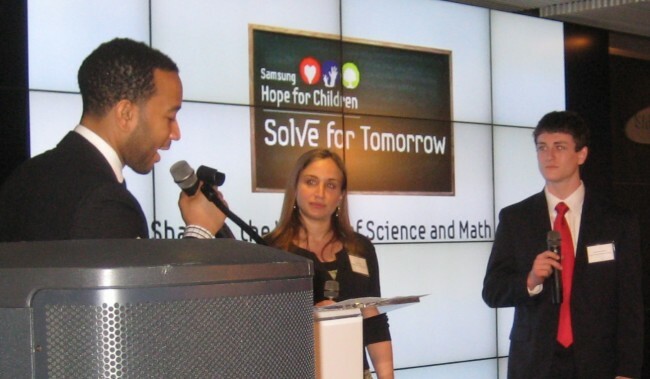 What’s innovative about John Legend’s partnership with Samsung‘s $1 million competition is the smooth integration of community, STEM education, and tech. Students were challenged to solve actual environmental problems in their communities, using tech provided by Samsung. “Math and science can sometimes can be seen as kind of nerdy subjects,” John Legend tells Fast Company. Technology helps students “see the connection between the work they do in school and then the cool products they’re able to use in the future that were made by great mathematicians and engineers.” From forestry protection to vegetable-oil powered cars, students designed some fun projects that, were, without a doubt, educational. Take South Shore Charter school, which solved its dearth of transportation options with a vegetable-powered shuttle car. In fact, the proposal claims that fees charged from “Vegy Vans” rides will actually make money and allow them “finance further green endeavors.” The project is a healthy mix of mechanics, environmental chemistry, logistics, video editing, and good ‘ol entrepreneurship. Samsung’s educational design is, perhaps unwittingly, part of a larger movement towards community-centered curricula that solve real-world problems and climax in an engaging presentation. The so-called “Reggio Emelia” curricula are traditionally reserved for pricey private schools, like Google‘s own daycare, that can afford the highly paid staff and have the flexibility to work with student-led topics. The grand prize winner, West Salem High School, snagged 155,000 worth of technology for a kitchen-sink style approach that helped the city measure the viability of salmon repopulation at local stream, and had the students build their own mini-solar vehicles and wind turbines (the heart-tugging story of how water dams destroyed the food source of native Americans certainly helped, too). Sumsung, of course, sees ancillary benefits to workforce preparation and user feedback. “It’s important we have a numerate and literate workforce,” says Samsung Executive Vice President David Steel. Additionally, close partnership with the grand-prize winner offers Samsung valuable user testing insights into what works, what doesn’t, and any hidden consumer needs.